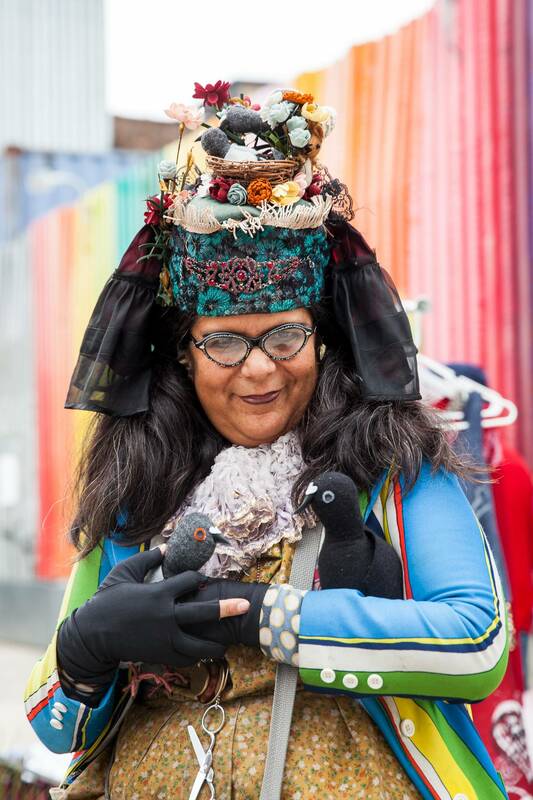 I'm Tina Piña Trachtenburg and I make soft sculpture pigeons in New York City. As soon as I moved to New York City in the late 1980s, I fell in love with the pigeons. I've always loved all animals. A couple of years ago I noticed that there was a flock of pigeons living on our roof. I started feeding them. Now they all know me and when I leave the house to run errands, they follow me down the block. I carry a lunchsack of birdseed with me everyday to feed the pigeons as I go about my day, walking down the street. I've been making art my whole life. I love using all kinds of fabric to create different things, from puppet shows to my own clothing. I needed to find a way to help people understand that pigeons are beautiful. I started making my pigeon soft sculptures. By setting them up on random sidewalks my sculptures became street art. Now I spend all of my days making my pigeons and doing outstallations all over the city. I create my pigeons primarily of acrylic felt. I like to make them resemble the pigeons I see throughout various locations in the city. They may be dark, charcoal gray, black, or light gray. My favorite is the common Blue Bar Pigeon who has a light gray to black face and two bars at the base of their wings. I use recycled clothing for body stuffing. I stuff the heads with polyester fiberfill. For the feet, I use wire that is twisted to form the foot of a pigeon, wrapped in pink, red or black yarn. I use black plastic coating to make the toenails. The beaks are backed with interfacing. The feet are made to be bendable and adjustable so that they can be wrapped around objects or flattened to sit on a table or bookshelf. Look at a pigeon the same way that you would look at a rose, or a bed of wild flowers. They are beautiful and unique, with each one being different from the rest. It is a privilege to have them around us. For updates, please check instagram or twitter. BBC "Your pictures on the theme of 'wonderful world'"
OK Whatever "N.Y.C.’s Patron Saint of Pigeons"
NBC News "Think Pigeons Are a Nuisance? Meet New York City's Pigeon Whisperer"
The Only Living Girl in New York "Mother Pigeon"
Pizza Rat Wins! Jeremiah's Vanishing New York, CBS/Good Day Sacramento, New York Post. Coolhunting.com "An artist's hand-felted birds demonstrate the beauty found in urban wildlife"
Bill Cunningham, New York Times At the Market" - Style section video. The New Yorker "Above and Beyond: Pigeon Flashflock Outstallation"
Video: "Mother Pigeon Takes WSP"
Boweryboogie.com "When Those Feral Pigeons You See in the Park Are Actually Sculptures"
Bushwickdaily.com "Tina Trachtenburg’s BOS #Flashflock Exhibit Made Me Not Hate Pigeons So Much"
Auctioncentralnews.com "Reading the Streets: Tina Trachtenburg's flash flock"